A 71 year-old man tripped at home and bumped his forehead on the wall as he went to ground. He did not lose consciousness and apart from a minor bruise on his forehead and a major bruise on his ego, his only complaint is markedly blurred vision in his right eye. He has had previous cataract surgery on both eyes. 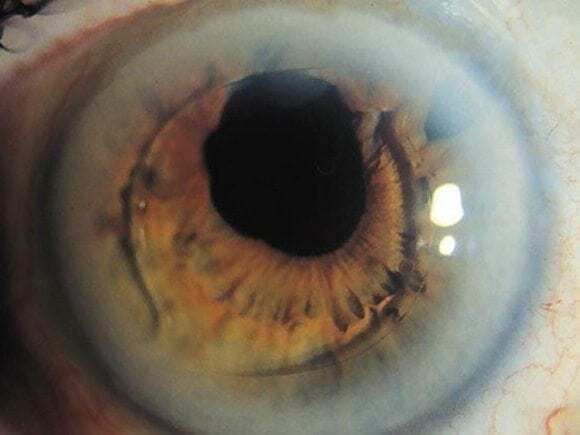 Dislocation — anterior or posterior displacement of the lens resulting from complete disruption of the lens zonule fibers. The following questions relate to lens displacement in general (not just implanted intra-ocular lenses). Q3. What features should be sought on history and examination? Symptoms: monocular diplopia or visual distortion with subluxation marked visual blurring with dislocation. Any associated injuries (ocular or otherwise)? Slit lamp exam: edge of a subluxated lens can be seen when the pupil is dilated. Iridodonesis — trembling or shimmering of the iris after rapid eye movements in lens dislocation.